When they are playing by themselves, I do my best not to interfere. I don’t dictate how J and K play and I don’t show them the “right” way to play with a particular toy. It’s up to them how they want to play it out. I encourage them to fully use their imagination when they play. I will do my best not to criticize unnecessarily. Sometimes, they don’t even need a toy to begin with. They will find anything in the room and make stories out of it. It can be a piece of paper I tear from a letter with perforation. It can be a string. It can be a used sardine can. It can be an ice-cream stick. It can be anything as long as they use their creativity to create something fun out of nothing. With free play, they set their own rules. They can break any existing rules people set before hand. And they can fantasize anything they wish. Without parents’ involvement, children are free to explore. They can’t help but to be independent and creative. While they are playing, parents can have their private time. 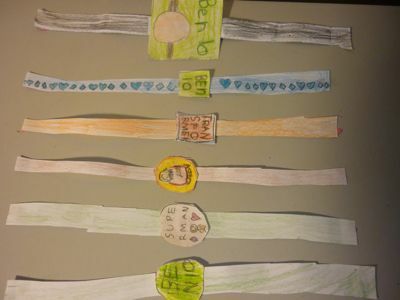 Recently, my 7-year old daughter, J got herself making a watch – out of a request from her younger brother, K.
J made the watch out of paper. And colored it with pencils. 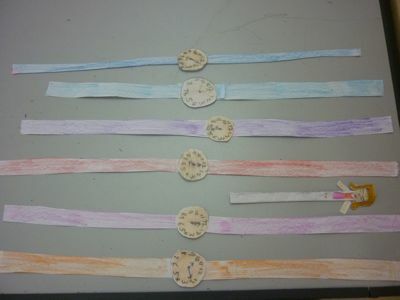 The newfound interest was rubbed off on K and both of them started to make a series of wrist watches with different themes. 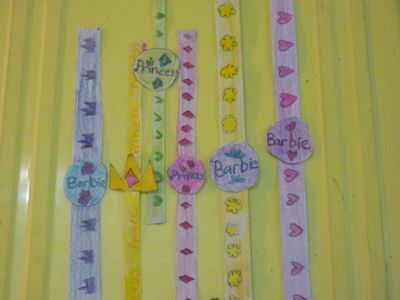 After finishing making children’s watches, they moved on to make watches for adults. At last count, both of them have made at least 30 watches in total. 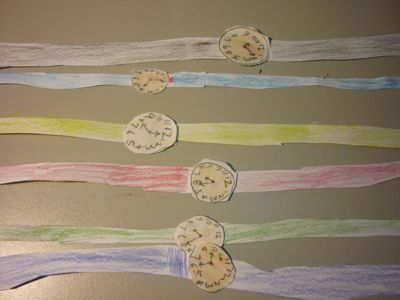 Just yesterday – I don’t know where she got the idea from – J had an inspiration to set up a shop selling watches they had made. Since the idea came about, J and K were busy setting up the shop. They spent a whole morning on the latest venture. I thought it was a simple shop with a table as the display for watches. I was surprised when I took a break from playing my new MacBook Pro to find out that they came up with more things than I expected. 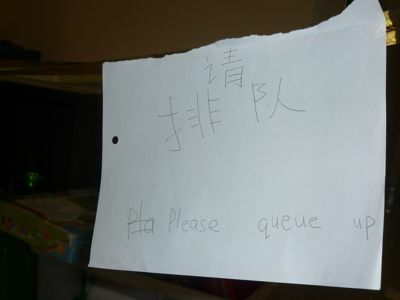 They put a line for customers to queue up. They must be expecting a stream of non-stop customers going to their shop. 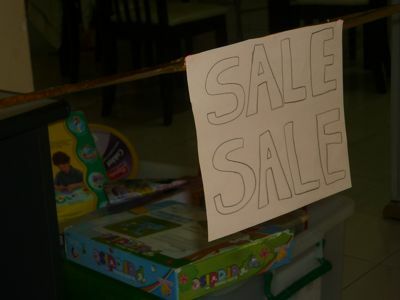 They put up a SALE sign to attract customers. 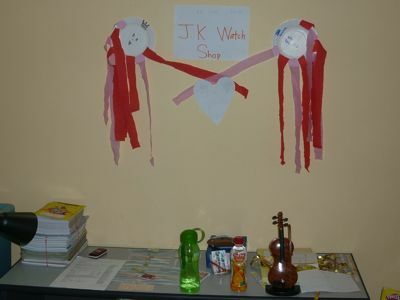 They even named their shop as J.K. Watch Shop. What a name. Not only that, they also created a signboard for the shop. They prepared handwritten business cards with names and fictitious telephone numbers on them. They prepared a makeshift credit card machine. My wife and I were given credit cards so that we were able to use them on the watches. They came up with a promotion to push up sales: 50% off with freebies. They prepared receipts for purchases. And lastly K, with a pencil and a piece of paper on hand, pretending he was busy doing the accounts and stock taking for the shop. All of these started off with ONE watch. And it quickly snowballed to other things. My wife and I didn’t interfere in their “project” except once in a while J came to us for help on how to spell a word correctly. That’s about all. After setting up the shop and after dinner that night, as if her brain was full of ideas, J came up with another idea: her own version of Snakes and Ladders board game. 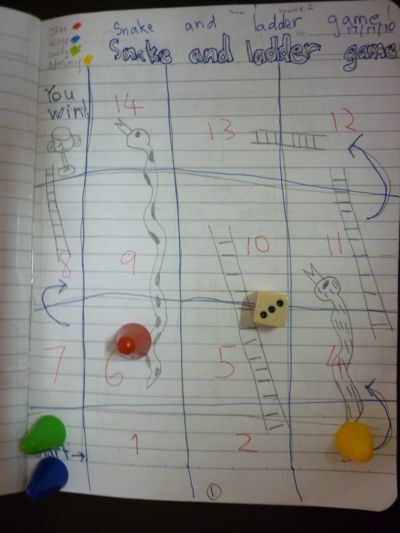 She drew a simplified Snakes and Ladders game in one of the used exercise books. I was appalled at the speed she came up with the game. When done, she “borrowed” a dice from a real Snakes and Ladders game that we bought some time ago. And she invited everyone to play the game. I thought it was easy but sometimes her version of the game can really test my patience and it is not easy to win too.